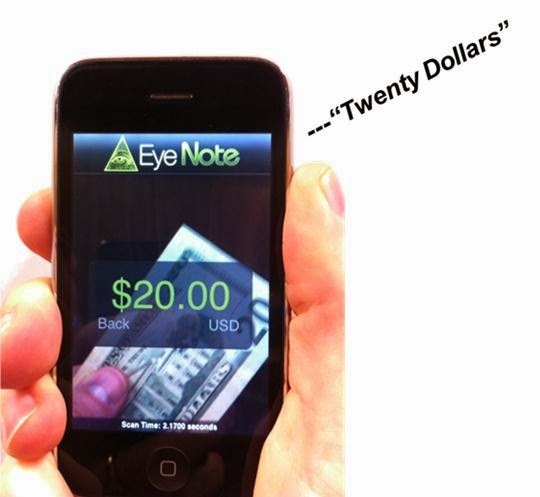 The EyeNote® application (app) was developed by the Bureau of Engraving and Printing (BEP) for the blind or visually impaired to use as a tool to increase accessibility to Federal Reserve Notes (U.S. paper currency). EyeNote® is built for the Apple iOS to allow the user to scan a bank note and communicate its value back to the user. The app is available as a free download on the Apple App Store℠. It runs without any special filters or background material. A data connection is not required for the app to work. Face or back of note to camera. Partial note recognition (note can be handheld). No equipment modification, special background materials or special lighting required. Camera flash is not required. No data connection required - all processing on device. Currency designs from Series 1996 and forward. Note can be on a complex background. User selectable spoken output English or Spanish, based on device language setting. Spoken mode also indicates the front or back of note to assist in vending use.